Line from the movie: "Citizen? They're not allowed in here. 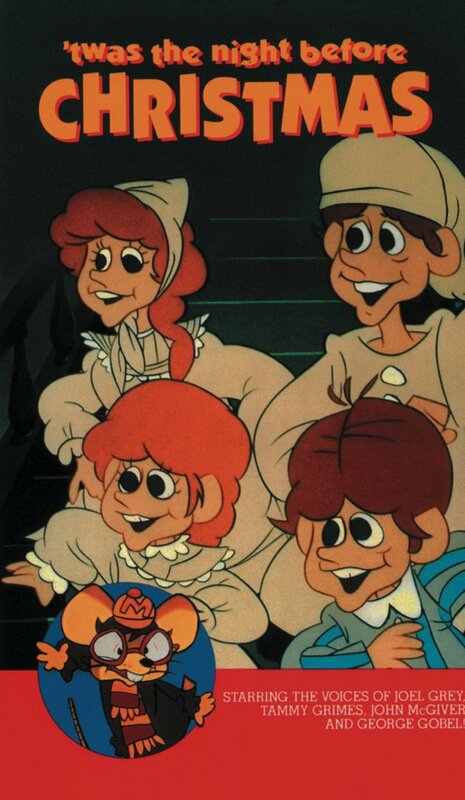 This is public property"
First broadcast in 1974, ‘Twas the Night Before Christmas may not be the most popular Rankin / Bass Christmas special, but like many of the studio’s holiday-themed shorts, I looked forward to seeing this one each and every December when I was a kid. For reasons as yet unknown, Santa Claus is refusing to accept any letters from the children of Junctionville, and by all appearances, he intends to skip this small town when he makes his annual Christmas Eve run. While the human population is pinning its hopes on a special clock built by clockmaker Joshua Trundle (Joel Grey) that will play a Christmas tune when Santa flies by (one they hope will persuade him to stop there after all), the mice of Junctionville, led by Father Mouse (George Gobel), are trying to figure out why Santa is angry with them. To Father Mouse’s surprise, the answer is closer to home than he thinks! Months earlier, his eldest son Albert (Tammy Grimes) wrote a letter to the newspaper, saying he and his friends thought Santa was a “fraud”. As Mr. Trundle works tirelessly to build his clock, Father Mouse attempts to teach Albert the true meaning of the holiday, and together, men and mice alike pray for a miracle this coming Christmas Eve. 4. A couple of entertaining musical numbers, the best being the upbeat “Even a Miracle Needs a Hand”, which sums up the dreams and aspirations of the entire town. It may not rank as high on the “Must-See” list as Rudolph the Red-Nosed Reindeer, Frosty the Snowman, A Charlie Brown Christmas, or How the Grinch Stole Christmas, but when it comes to good, old-fashioned Holiday fare, ‘Twas the Night Before Christmas is every bit as inspirational, and just as fun, as many of the season’s classic offerings. I absolutely love this Christmas special I always have. Growing up I could not wait for this one to be all along with Emmit Otters Jug Band Christmas and Nestor the Long-Eared Donkey.